Instant Car Donation was founded with the goal of bringing donors and local charities together with an efficient and pleasant process. You can focus on deciding which of our respected charities is right for you instead of worrying about difficulties of researching how to make a donation. After your free pickup, we will assist you in recieving the best tax benefit possible for your generous gift. We take pride in helping smaller charities easily receive car donations, bringing people together while helping support those in the Glendale, Arizona community who need it the most. Here are some of our favorite charities in the Glendale area. We have made sure each of them are eligible for tax deductions when you help your local community by donating your car. Your values and choice can make a difference. Founded in 1981, the mission of the Chrysalis Shelter for Victims of Domestic Violence is to lead our community to broad-based solutions to prevent domestic abuse. For over 34 years, Chrysalis has been servicing the needs of women, children and men throughout the Valley who are trying to break the cycle of violence and abuse with a wide array of comprehensive services. The number of lives affected by Chrysalis has grown fourfold since its inception, with more than 1,200 individuals now being helped each year through the efforts of Chrysalis staff and volunteers. HALO (Helping Animals Live On) is a private, non-profit organization founded in 1994 by two women, Michel Herstam and Heather Allen, out of their homes in Phoenix, AZ. HALO provides temporary shelter to abandoned cats and dogs until they can be adopted into a permanent home. We help Animals Live On through increased adoption, sterilization and pet care education. Since HALO's inception in 1994, over 30,000 dogs and cats have found a new home, with our adoption numbers growing every year. In 2013, we adopted out over 7,000 dogs and cats in to new homes, giving them a second chance at happiness! Founded in 1993, the mission of Make-A-Wish International is to grant the wishes of children with life-threatening medical conditions to enrich the human experience with hope, strength and joy. Make-A-Wish International serves children outside the United States in nearly 50 countries through its 39 affiliates. With the help of generous donors and over 32,000 volunteers, the Make-A-Wish Foundation has granted more than 350,000 wishes worldwide since inception. Scottsdale League for the Arts (SLA) is a volunteer organization of accomplished men and women who support artists, arts programs and arts education through fundraising and special events. In order to offer continuous value and assistance to the arts, the League awards all net funds raised to a variety of arts focused organizations through a grants program. The SLA was originally formed in 1978 as the Men's League of the Scottsdale Center for the Performing Arts with a mission to raise funds for capital improvements to the Performing Arts Center. The Phoenix Symphony, performing live symphonic music of excellence, beauty and vitality at a consistently high level. The vision of The Phoenix Symphony is to be the arts leader in the revitalization of a thriving Arizona. In ten years, The Phoenix Symphony will be a cultural icon and a reason people will like to live in Arizona whether they attend concerts or not. And, the Symphony will be one of the many compelling reasons people will want to move to Arizona. This will happen because our community will recognize that the Symphony provides unparalleled civic value. Our mission is to provide the joy of music as a catalyst in helping Arizona to become the best place in America to work and live. We accomplish this mission by creating high quality music experiences to feed the souls of our residents, to bolster the cultural economy and to educate and strengthen our next generation resulting in a creative workforce. There are many charities, for example Crisis Pregnancy Centers of Greater Phoenix, in your Arizona area which could benefit from your automobile, such as a Lamborghini Murcielago, donation. We not only help you donate to a nearby charity, but we also focus on supplying local non-profits with an easy way that they can concentrate on their work that is important to accept donations. The donation is likely to make the difference for charitable institutions, for example Crisis Pregnancy Centers of Greater Phoenix, while helping to support those within their neighborhood Glendale, Arizona community who want it the most bringing folks together. It is important to Instant Car Donation which you get the largest tax deduction benefit possible without having to navigate complexities or execute research. We pre-qualify all of our participating 501-3C non-profit charities to confirm your donation would be tax deductible. The procedure will be streamlined to both you and the charity of your own choice. We'll provide a 1098-C tax document to you following your contribution. Car donations are the most accountable method for many folks to make a donation. Because of this, one of our aims is to empower those electing such a decision by ensuring that the car goes to the charity which reflects their values. We make charity decision an integral part of the process, when donating together with us. In case you want us to pick which charity would be helped the most instead we could do this also. In case you've got a charity in mind you would like to contribute to, then you can donate with us. When there are numerous advantages to charities which receive donations from individuals, the advantages to the you, the donor might not be as clear. The largest benefit which most people today hear is the opportunity for a tax benefit. This means that the resale value of the given vehicle can be written off on your tax return. There are a few limitations on this sort of deduction, which means you could want to talk to a tax pro before making the donation. Another benefit of donating a secondhand car to charity is the chance to just get rid of the car, such as your smart smart, without having to attempt to repair or sell it. Most charitable car donation programs will anyhow vehicles whether they're operating or in need of repair. Some trucks or cars which are beyond repair will be sold for scrap or parts and any cash received will go to the charity. Car donation programs have become popular in Arizona over the last ten years or so, as more charities are searching for new and creative methods to create funds. Today, the amount of charitable automobile donation programs is in the hundreds or perhaps tens of thousands. In case you've got a favorite Glendale charity you want to make contributions to, it is most likely possible for this charity to get at least a part of the funds when you donate your old vehicle, like your Pontiac Vibe. Aside from the charitable tax benefit and not having the hassle of managing an old vehicle, like a Chevrolet Trailblazer, the feeling of having the ability to help those in need might be the best reason to donate your vehicle to a charity. Most used car donation programs will either sell your vehicle to raise funds for your cause, utilize the car in the daily operations of their organization, or provide the car, such as a BMW 323i, to a somebody who needs help either for free, or even for under the average market value. Charitable car donation programs permit you to give your used auto to the charity of your own choice. Visit our charities page to pick a charity in Arizona to contribute to. When you opt to generate a donation of a used vehicle, when the charity sells the car, like a Hyundai Santa Fe Sport, to get over $500 they have to send you a receipt which lets you subtract the sales price of the automobile on your tax return. If the older car you made a decision to donate is not worth at least $500, then the IRS allows you to ascertain the reasonable market value. This is the value that somebody would be inclined to pay for the car, such as a Audi Q5, if buying it from you. So as to receive the tax deduction, so you'll need to itemize your deductions on your tax return. You claim the tax benefit, along with the charity gets to utilize the car, like your Mazda Navajo, sells it and uses the proceeds for the benefit of the charity. That's a win-win for everyone involved. Is there a financial tax benefit for donating my automobile in Arizona? We can guarantee your automobile goes to a non-profit organization, for example Crisis Pregnancy Centers of Greater Phoenix, which is eligible for tax deductible donations and help you recieve a reciept for your donation. You may be able to have a tax benefit should you itemize your deductions. For contributions around $500 it is possible to utilize Kelley Blue Book and also for bigger donations the charity must verify what they recieved for the auto donation (more info). 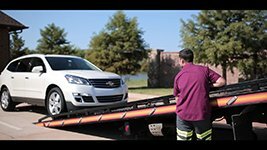 We'll organize a tow truck to come get your automobile and send it for you. It could not be easier now to help the non-profit organization of your choice! Do you take donations for vehicles which are damaged or missing parts? We accept automobiles in all conditions! Go ahead and submit your request to donate, and we will see what we can do. Would you help me find a Glendale non-profit organization that is suitable for my personal morals? We would like to assist you ensure your donation goes to a cause in Glendale you care personally about by helping you select a non-profit organization, such as Chrysalis Shelter for Victims of Domestic Violence, that meets your values. This is so important for us we do it every single time you give with us! What non-profit organizations do you support in Glendale? Instant Car Donation proudly supports respected national Glendale nonprofit organizations in the neighborhood area. We work with dedictation for you to be sure support is recieved by the organizaion from your automobile. How do I prepare my Arizona title? All owners around the title must complete the section of this title tagged "assignment of title by owner" or "transfer of ownership by seller". The majority of states require registering and printing owner names. You need to fill out any fields that require documentation about a buyer/purchaser/transferee with information about who you are donating the vehicle, like a Infiniti QX60, to. You might find instructions for your house state here. First we will speak to the charity of your choice (or pick one for you if you requested that rather than picked) to make certain they want your vehicle, like your Mercury Mountaineer, which takes about one business day. We'll arrange for a tow truck to come to you for simple pickup. When it's taking a bit longer feel free to give us a call. Have you thought about donating your car to a charity? It might perhaps not be as easy as you think. Most charities, such as for example Chrysalis Shelter for Victims of Domestic Violence in Glendale, Arizona aren't equipped to handle car donations, as it takes one to employ staff to simply take in the vehicle, assess it, sell it, and then do most the paperwork and accounting. By this time this process is finished, the true monetary donation to the non profit might be quite small after paying for each of the overhead. Let us in instantcardonation.com help. We make it quite simple for any nearby charity, such as for instance Chrysalis Shelter for Victims of Domestic Violence in Glendale, Arizona to have their very own car donation program because we expel all the hassle. Every time a non-profit, such as Chrysalis Shelter for Victims of Domestic Violence in Glendale, Arizona spouses with immediate Car Donation, they be given a full-service car donation plan. We take care of all and can simply give the charity a donation assessed with each of the necessary paperwork completed from the ingestion and sale of each vehicle. Our process is simple. We are going to take any vehicle, such as Infiniti M37. To begin with fill out an intake form. Then, we'll contact you to verify your auto donation. Next, we will send a tow truck to pick up your car within two days. From that point, we take care of every thing. We are going to fix up the vehicle and sell it for the maximum value, in order for your donation is going to be maximized, or if it really isn't worth mending up we'll sell it is. It is a Win Win. The hassle of owning their own automobile donation program isn't always worth it for local charities, however when we be mindful of most of the heavy lifting, it is a great source of design for non-profits. We help will help local charities such as Crisis Pregnancy Centers of Greater Phoenix from Glendale, Arizona and larger charities like Friends of United Hatzalah of Israel. For instance, your donation will help Chrysalis Shelter for Victims of Domestic Violence in Glendale, Arizona to their assignment. This sort of fundraising support makes it possible for charities such as Chrysalis Shelter for Victims of Domestic Violence in Glendale, Arizona to focus their time and energy on what they truly are best at: helping others. If you have a neighborhood charity, such as Crisis Pregnancy Centers of Greater Phoenix in Glendale, Arizona that you would love to help and also have a car, just like a Porsche 944 to contribute, then simply fill out and ingestion today and we will be sure that you can make the most from the donation. Additionally, in case you don't see your favourite charity on our site, then feel free to send our site information into your charity and request that they join our schedule. Alternatively, you may reach us out in info@instantcardonation.org and we will get in touch with your charity of choice to determine if they'd like to possess their particular vehicle donation plan that's totally managed by us. Spread the word and help your favourite local non-profit, Crisis Pregnancy Centers of Greater Phoenix at Glendale, Arizona want to increase their fundraising and reach their own goals with their particular car donation system! Whenever you contribute a vehicle, such as a Hyundai Elantra, Tiburon, you are joining the millions of Americans who donate to charitable causes annually. You might believe that you do not have the money or resources to truly bring about a cause you to rely on. However, donating a vehicle is on the of the best ways which you may add your aid your favourite local charity, like Crisis Pregnancy Centers of Greater Phoenix in Glendale, Arizona. Though it's really a little action, your community in Glendale, Arizona and beyond will thank you! In reality, in 2016, charitable lending was quantified about 390.05 billion dollars, or 2.1 percent of the GDP for the exact same year. It's also reported that charitable giving has grown year almost every year since 1976. Even more unexpected is how young people today give even more than their grandparents did, if they were the exact same age. Are you astonished that Americans contribute so much and in so many ways? You may ask yourself, how can you best talk about the resources you have to make the area community you are living in a much better place? For those who own a vehicle, such as a Lamborghini 147, which you're not using, or is sitting on your own garage or drive, why not contribute to get a charitable cause? Whether your vehicle be new or old, working nicely or in need to another lifetime, you can contribute it to the charity of your choice farther its essential mission. Especially, small and moderate sized non-profits like Chrysalis Shelter for Victims of Domestic Violence are in need of extra funds as a way to enhance their reach into the local community. Charities like Chrysalis Shelter for Victims of Domestic Violence at Glendale, Arizona, are always in need to windfalls to increase or expand their charitable pursuits. When you give your car, you breathe fresh life in these essential apps, when you can help them receive unexpected new funding. Giving must be simple, but if not it? We think so too. To donate your car, all you have to do is click on the contribute button. We'll contact you to arrange a complimentary pickup for the vehicle from Glendale, Arizona or your neighborhood place. . All you have to do is inform us which honored charity, such as United Way of Lake County, you would like to benefit during your contribution, and we'll take care of the remainder. We partner with not only all the thousands of charities listed on our website, but if you want to aid a charity which people don't currently list, we'll enter contact that charity to get you so as to complete the contribution process. We'll even provide you with paperwork to assist you get the maximum tax-deduction for the donation! Donating your car is a win win each moment!